In late December, April and I flew to Guatemala, to put the project into action. We met with Heather Graham, Director of Funds and Communication for Casa Guatemala, surveyed the grounds and interviewed staff to find the areas of most need. Casa Guatemala is safeguarded and constrained by its isolation on an island concealed by a thick sweltering jungle on the East Coast of Guatemala. The only way to transport goods and people is by boat down the fresh river waters of Rio Dulce. There is no full time electricity here, so no refrigeration. Food storage is extremely difficult as humidity and bugs increase the rotting process. Casa Guatemala often shares surplus food with 18 surrounding communities to ensure there is never any waste. The infrastructure also suffers punishing environmental blows. In 1999, a devastating earthquake completely destroyed all the shelters and school rooms. There is a high cost to protecting the infrastructure from both weather and extreme use. The water situation is improving with a new filtration system, but even that will require maintainance. 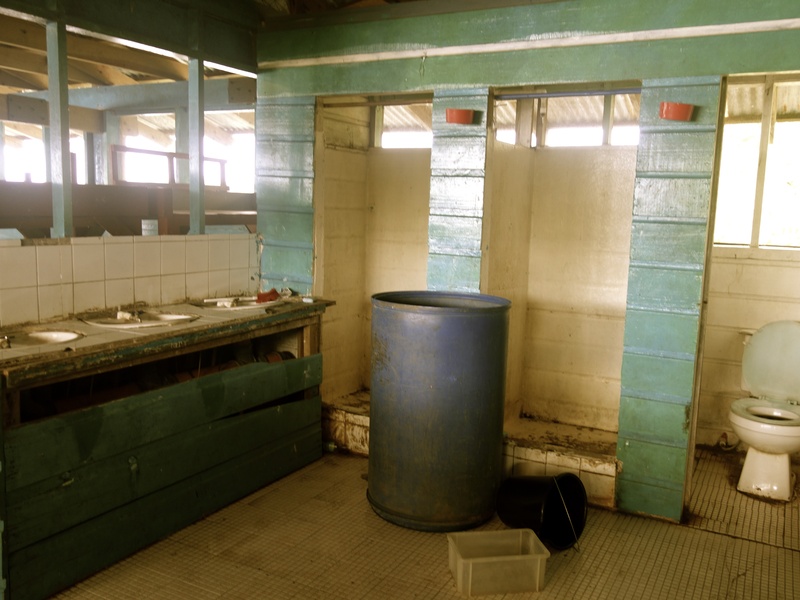 The bathrooms were by far in worst state of disrepair. Leaky pipes, broken faucet, inoperable toilets stewing in sewage and mould infested shower curtains contaminate the children’s environment. Unsanitary conditions can lead to illness and medicine or doctors are not always easy to come by. List in hand, we headed to largest nearby community to purchase the necessary supplies. We visited the local hardware store for most of the repair and restoration goods. We also purchased art supplies at a small craft shop on the main strip. At the open air market we added a piñata and treats to reward the children. (We didn’t want all our contributions to be toilet-related :P) In this manner, we ensured that every cent of our expenses directly benefited the local economy in Guatemala. We also helped bridge the gap between the donators and the recipients without those sore administrative costs that can reduce the direct benefits down to 10 cents on the dollar! The Christmas holidays is a special time for all children. At Casa Guatemala, many of the kids who do have families often make the journey back home. Those families are so impoverished that they cannot provide the basic survival needs for their kids, and this is why they live at the orphanage. It is the children’s only opportunity to escape life on the streets, begging or working, vulnerable to the strong presence of gangs and prostitution. Casa Guatemala gives them shelter, feeds them and offers education through Grade 6, (schooling beyond this grade is a rare achievement for the majority of indigenous children in this country). My heroes @ Casa Guatemala – Karina Noriega *From my original 2010 visit. I can’t believe how much she’s grown @ Casa Guatemala – Karina Noriega *From my original 2010 visit. Every year there is always the small group that stays behind. These kids have no one beyond the watery boundaries of this sanctuary. I have watched them grow up for over three years now. This visit being my fourth time helping at Casa Guatemala. Many of the kids have graduated from the toddler quarters to the kids house. They are phenomenal little people, full of love, energy and mischief. Every day of our visit they make sure that we know that it is our love and support that they most value. In addition to participating to overseeing the project from fundraiser to deliver and installing the new equipment, we made time to spend with the kids. This is all about them after all. 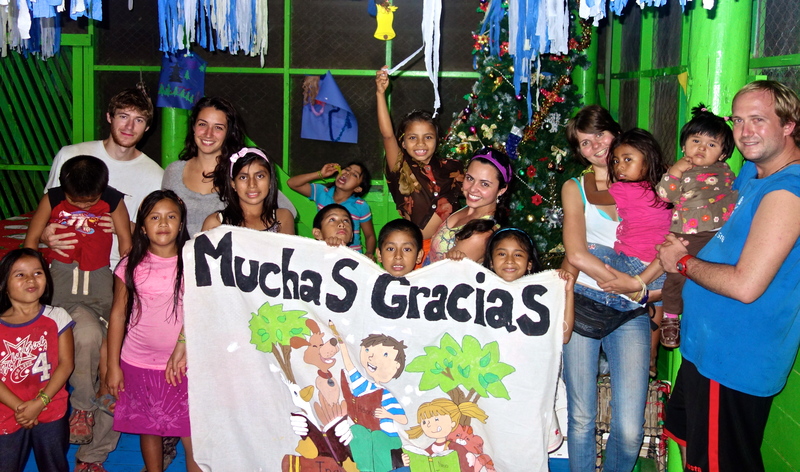 To end another incredibly memorable volunteer opportunity, we surprise the children with the candy stuffed piñata. Seemingly inexhaustible, they battered Mrs. Santa until her delicious guts spilled all over the dirt floor. Thank you to all our contributors in Canada and in Guatemala. This project would have never happened without your generosity and support. Thank you April. I couldn’t have done this without all your hard work and dedication. Your canvassing and fundraising, your heavy lifting and constant positivity made a world of a difference. Thank you to Heather for all time spent guiding and informing us. To the teachers and volunteers for their industrious enthusiasm to changing lives. And to the children, whose love and gratitude makes every visit memorable. Stay tuned to next week story. You are not going to want to miss this opportunity!